PHILADELPHIA – So-called "hot" tumors filled with T cells are often considered to be more sensitive to immunotherapy compared to "cold" tumors with fewer T cells, but a clear demonstration of why has eluded cancer biologists–until now. A team from Penn Medicine's Abramson Cancer Center (ACC) discovered that whether a tumor is hot or cold is determined by information embedded in the cancer cells themselves. In a new study published this week in Immunity, researchers probe the role of "tumor heterogeneity," a cancer cells' ability to move, replicate, metastasize, and respond to treatment. These new findings could help oncologists more precisely tailor treatments to a patient's unique tumor composition. Recent studies from Penn Medicine and other institutions have suggested that the degree to which T cells are attracted to a tumor is regulated by genes specific to that tumor. "There is no disputing that targeting immune cells has led to promising outcomes for many cancer patients, but not every person responds to these types of treatments," said senior author Ben Stanger, MD, PhD, a professor of Gastroenterology and Cell and Developmental Biology in the Perelman School of Medicine at the University of Pennsylvania. "Every tumor is different, so we're investigating how to use the underlying biology of tumor cells to successfully treat more cancer patients." Stanger is also director of the ACC Pancreatic Cancer Research Center. Part of a tumor's diversity includes the amount and type of immune cells that become part of the cancerous mass. To grow, tumors need to avoid the immune system, which happens in two ways: by developing as a cold tumor with a limited number of T cells, or as a hot tumor by exhausting the T cells, effectively protecting tumor cells from destruction by a patient's immune system. Pancreatic tumors span the spectrum of T cell infiltration, but the basis for this heterogeneity is poorly understood. In this study, the Penn team created a library of pancreatic tumor cell lines from a mouse model of pancreatic adenocarcinoma. These cell lines, when implanted in normal mice with a working immune system, grew into tumors that fell into the hot and cold categories, with cold tumors being the dominant type. In addition, they found that whether a tumor was hot or cold determined whether it would respond to immunotherapy. Half of the mice with hot tumors experienced tumor regressions after treatment with a checkpoint blockade drug, an effect that was enhanced with the addition of either an anti-CD40 agonist, combined chemotherapy, or both. Of the 26 mice bearing hot tumors and treated with a combination of chemo- and immunotherapy called GAFCP, 20 survived to more than six months, suggesting a durable response to the therapy. By contrast, none of the mice with cold tumors cleared their cancer following this therapy. To understand the molecular basis of this phenomenon, the team searched for factors released by cold tumors that could attract myeloid cells. They found that cold tumor cells make a compound called CXCL1, which signals myeloid cells to enter tumors and T cells to stay away, which eventually results in insensitivity to immunotherapy. Conversely, knocking out CXCL1 in cold tumors promoted T cell infiltration and sensitivity to immunotherapy. The cell lines that the team generated mimic a spectrum of pancreatic tumor features, including the types of immune cells they contain. 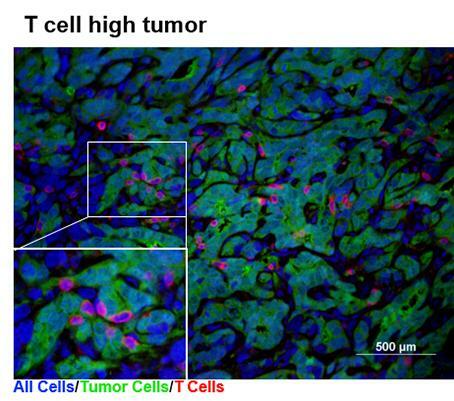 In the future, these tumor cell lines could help to further identify and optimize therapies for specific subsets of patients with various states of tumor heterogeneity. Collaborators on this study include co-first authors Katelyn T. Byrne, PhD, and Jinyang Li, a graduate student in the Stanger lab. Byrne is a Parker Institute for Cancer Immunotherapy fellow in the lab of coauthor and Abramson Cancer Center director Robert H. Vonderheide, MD, DPhil. This research was supported by the National Institutes of Health (R01-CA169123, P30-DK050306, P30-CA016520), the Parker Institute for Cancer Immunotherapy, the William C. and Joyce C. O'Neil Charitable Trust, and the Memorial Sloan Kettering Single Cell Sequencing Initiative.